A camera is one of the first things a filmmaker purchases for a project. 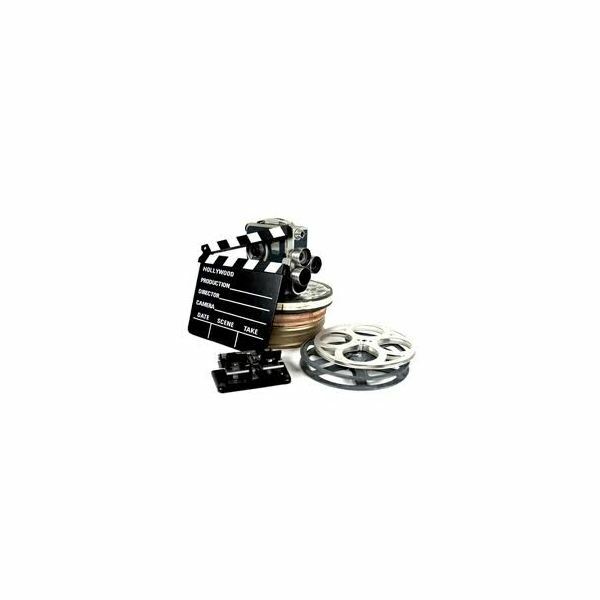 Those with a large budget may use an advanced 35mm film camera, for which film has to be purchased and processed once shooting is complete. Independent filmmakers and a few mainstream films are now using digital cameras to create their films. Digital cameras are easier to use and relatively cheaper than their film counterparts are. However, there are some advanced digital cameras that cost a significant amount of money. In addition to the ease of a digital camera, these devices come in a variety of sizes, making them easy to transport. A standard production will also need lighting, audio, accessories for the camera and editing equipment. Lighting consists of using the correct bulbs, gels, reflectors and mounts to secure the lighting in place. A production will also need audio such as a boom microphone and lavaliers. Once post-production comes around, the filmmaker will need editing equipment to piece the film together. Editing software and an editing workstation is needed to create the final product. This guide will help you find the most appropriate equipment for your project, from the perfect high-definition camera to the best lighting for your film. Sony is one of the leading companies that provide exceptional film equipment. We have found some of the best cameras Sony has to offer. You will find the latest in digital technology and high definition that will make your production look amazing in this extensive list of cameras that range in price and size. If you don't have the funds to purchase brand new equipment, this article can give you advice on how to rent film equipment. Renting equipment can be a better alternative, especially if you only need film equipment for a short period of time. Learn how to choose the best rental package for your production and how to find the best price for your rental. Find out what lighting kits work with different productions and what accessories work with various kits. You will get an insight into the best lighting accessories for your project, learn how each accessory works and what a filmmaker can achieve by using the accessory. There are a few pieces that are essential to a film production. This article gives you a list of the most important tools for a successful film production. The author focuses on digital equipment and gives you a simple rundown of the tools and equipment that are sometimes overlooked. If you are a beginning filmmaker, this article can help you make your film a success. Learn why some of the film equipment you use on your productions is essential. The author shows you what you can use to transform your story into a great movie. If you cannot afford to purchase a ready-made editing workstation, you can build one yourself. Provided you are handy and have the necessary tools, you can make your workstation dreams come true. This article will teach you, step-by-step, how to build your own editing workstation including a list of tools and film production equipment that completes an editing workstation. A color grading station is used during post-production, most notably when you are editing the film. The color grading station helps you correct and regulate the color in a film. Find out what tools and equipment you need to create a customized color grading station. Editing and video editing software takes up a significant amount of space on the computer's hard drive. You need a computer that can hold your footage without slowing down. This article highlights a few computers that are ideal for film editing. Whether it's sunny or raining, there is a possibility that film equipment can be damaged when faced with the elements. If you need to use your equipment outside, this article is perfect for you. You will learn how maintain your equipment outdoors and what to use to make sure it isn’t ruined. A camera crane mounts onto a camera and gives the filmmaker to ability to get high camera angles. Camera cranes can be mounted onto digital and film cameras. This article teaches you about camera cranes and their many uses. Clapboards are used to mark each scene for the editor during post-production. Many people are used to the wooden clapboards of filmmaking past, but technology has given us digital clapboards. Instead of writing the scene number onto the board, it can be digitally added. Learn how to use a digital clapboard for your next project. Gaffer tape is used to keep all your film equipment in place. It is a strong workplace tape that is common in the film industry. Discover how to use gaffer tape effectively. A tripod jib crane is another crane that is mounted onto a film camera. The tripod jib crane keeps the camera stable while providing added movement. This article will show you how to use a tripod jib crane. A dolly and a slider allow the filmmaker to move the camera freely while keeping it steady. The camera can be attached to either device. These devices are ideal for shots where a car or a similar vehicle is used. The author gives you the pros and cons of each device and helps you make the most intelligent decision. DSLR cameras are extremely popular these days amongst filmmakers. These devices give filmmakers the ability to point and shoot, making filmmaking easier and more accessible. Find out which DSLR camera is right for you and how you can use one.